You can’t leave Isabela, Puerto Rico without dropping by Jobos Beach. This whole area, just west of the former Ramey Air Force Base, now Raphael Hernandez Airport, is breathtaking. You can hop on Jet Blue, as of this writing, from JFK and be here in a few hours. Most tourism to Puerto Rico happens around San Juan. This coast is often overlooked. The northwestern Puerto Rican shore has wild sand dunes and a handful of recommended beaches we have to tell you about, as they are better known to surfers. 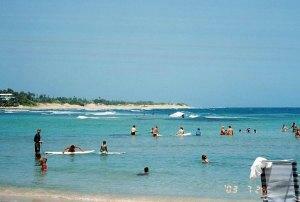 But we were asked about what locals consider the better sites to surf and Jobos Beach in Isabela was always mentioned. So with a little research we found that even though it takes some work to get to – the reward is great. You’ll be presented with a family beach that encompasses something for everyone. Seems people have grown up coming here and have great memories of it. We just reviewed Shacks Beach for you, some five miles from Isabela. But two miles east you’ll see Jobos Beach. It’s a nice walk from one to the other. Jobos curves beneath an unusual geological formation known as a fossilized sand dune. It’s incredible to see. The cove her seems serene, but be aware of the rip currents. Even in the calm area, tidal currents move deep. 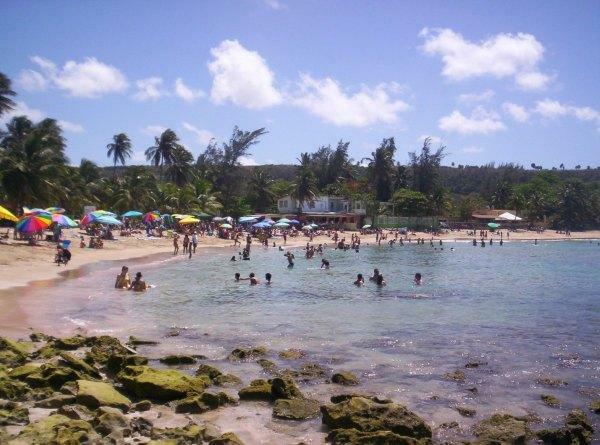 This natural beauty, Jobos Beach, Puerto Rico, is a haven for surfers. You’ll catch the local gang in the southwestern corner by the coral heads. But Jobos also offers a strip of sand great for families with children. Bunches of restaurants line the beach. There’s fishing here, snorkeling, scuba diving, along with kiteboarding and windsurfing. This area is great for exploring, too. See some unusual surf and shore formations. There are a few hotels close by, but most are high priced between November and April. You’ll get more reasonable accommodations inland at Isabela. I was sationed at Ramey AFB in Feb 59. My new bride joined me 2 months later for what tuned out to be a two year honeymoom. We found Jobo beach within two months after our arrival. It was our favorite beach for the rest of the time we were there. At that time there was Airmns Beach and Officers Beach, both on base and Crash Boat Beach..
We came back in April, 2013 for our second honeymoom and to celebrate our 55th wedding anniversary a four months early, only this time she didnt get pregnant. Jobo Beach has always filled a special place in our hearts, and we are looking forward to another honeymoon celebration there. We didn’t make it back for another honeymoon as planned. My wife had ovarian cancer since June of 09, and we went back in April 13 while she was still feeling up to it. We planned to go back in April of 15, but she passed away the first of Feb, 15. She had an idea she wouldn’t make it and made me promise I would take our oldest daughter, who was born there on Ramey, back and show her everywhere we had taken her as a baby. In Sept, 15 I took both daughters back. They enjoyed all the beaches mentioned in my first post, but Hobo was their favorite. It was always clean, only crowded on weekends, and the people running the eating places were very friendly as usual. I even found some home made coconut candy that I hadn’t had since 1960, when we lived there. I don’t know if I will make it back because of my age and health, but if I have a choice, that is where I would go.